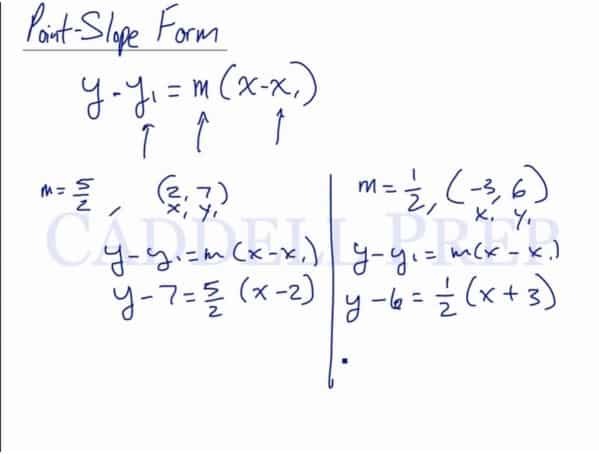 In the video above, you will learn about the point-slope form of a line and why it’s useful. What is the point-slope form of a line? If you are given a point that a line passes though, , and the slope , you can substitute the values into the formula. Do not substitute any values in for and . Point-slope form is useful when you know the slope of a line and a point it passes through. Substituting the slope and coordinates in, you are able to derive other forms of the equation of a line, such as slope-intercept. It’s possible to find point slope form without being given the slope. However, you will need two points that the line passes through instead of just one. The formula only requires one point, , but we need two points so we can find the slope. Use the slope formula to find the slope. After finding the slope, substitute it into the point slope form formula along with one of the points. You can use either point; it doesn’t matter which one you use. Let’s go over point slope form. where is the slope of the line, and are the coordinate of the line. Above are two examples of finding the point slope form of a line by substituting the slope and coordinates into the formula. Then instead of writing and , let’s just write them as and . So the point-slope form is just derived from the slope formula. From the point-slope form, we can find the equation of a line in a slope intercept. Let’s continue solving by distributing in the parenthesis. So now, our answer is the equation of a line in a slope intercept form which we dervied from the point slope form.